October 9, 2017 by andrea | Filed under Autumn, Soup/Stew, Thanksgiving, Winter. October here in Portland can be a mixed bag of weather changes. One day the sun is out and we’re blessed with Indian summer warmth. The next day may bring overcast skies and rain showers. Some days we even get to experience a potpourri of all that: sun, clouds, rain, fog. Yes, the weather here is fickle…some might even say it’s goofy. When the days are cool and crisp, I crave soups and stews like this recipe for Butternut Squash Soup. Not only is it healthy, but it’s easy to make and delicious. 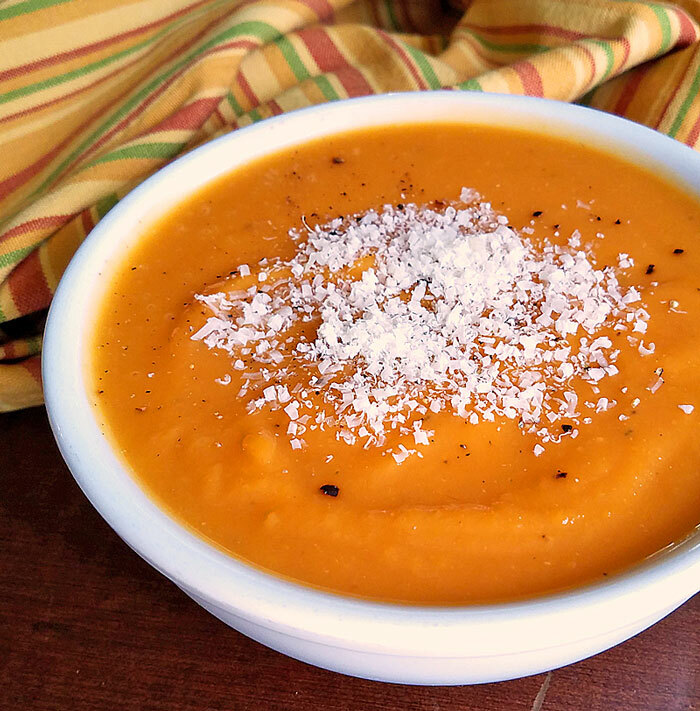 Some butternut squash soups add ingredients like apple or pear, and tend to be on the sweet side. This one, however, is savory. It would be a great first course for Thanksgiving or other Fall and Winter entertaining (you could make it a day ahead and reheat before serving). Remember to let the hot soup cool a bit before processing it in a blender. Also hold the lid down firmly with a towel when pureeing the soup so it doesn’t explode all over you and your kitchen. I’ve done that before and it’s not fun. An immersion blender simplifies this process, but may not get the puree as smooth. We like to garnish the hot butternut squash soup with homemade croutons or freshly grated parmesan cheese. Enjoy!